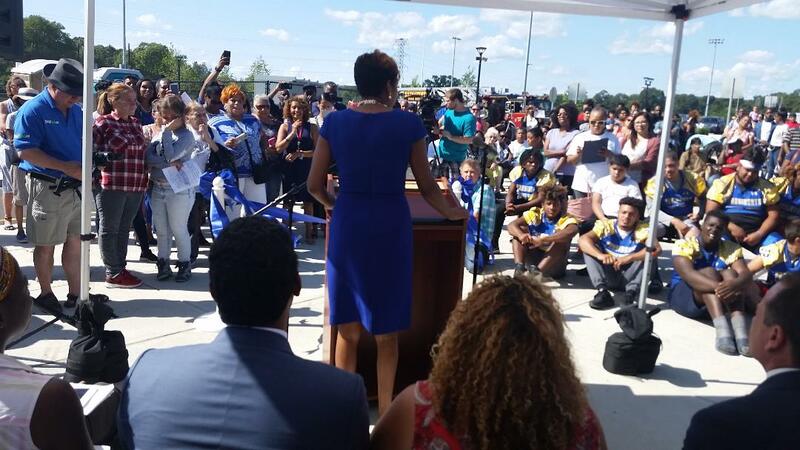 Superintendent of Schools Aresta Johnson addresses gathering at opening of new Harding High School in 2018. A reason cited for the cancellation of the forums was the bashing of some public officials rather than intended informational hearings regarding school board finances. Revealing in the Pereira/Walker commentary that follows is criticism of popular Superintendent of Schools Aresta Johnson that represents a break from their past praise for the school leader. As Bridgeport Board of Education (BOE) Members, we believe our role is to provide you with valuable information regarding the financial crisis facing our true public schools. We also believe it is your absolute right to advocate for your children, grandchildren, and students by meeting with those elected officials who make critical decisions that will impact your childrens’ and students’ lives today, tomorrow, and in the days to come. In the last three years the Bridgeport Board of Education has requested $40 million dollars from both Mayor Ganim and the twenty City Council Members. We have only received $1.6 million, which equates to just 4%. The failure of Mayor Ganim to keep his campaign promise to fund our schools has caused us to make over $38 million in devastating staffing and program cuts in a school system which was already severely underfunded. In fact, out of 169 municipalities in CT, no municipality contributes LESS to its public schools than Bridgeport with only 26% of our funds coming from our city and 76% coming from the state. We requested $16 million for 2016/2017 from Mayor Ganim. He proposed a budget with a zero increase and all 20 City Council members approved Ganim’s budget. We requested $11.2 million for 2017/2018 from Mayor Ganim. He proposed a budget with a zero increase and the City Council members appropriated $387,000. That is less than $19 additional per student. We requested $13 million for 2018/2019 from Mayor Ganim. He proposed a budget with a zero increase and the seventeen members of the City Council members appropriated $1.2 million. Only three City Council Members stood up for our over 20,000 students by voting no on the budget. Thank you, Pete Spain, Kyle Langan and Eneida Martinez. We hope you agree that providing factual information about the voting record of Mayor Ganim and our twenty City Council members, as it relates to the funding of our Bridgeport Public Schools, is valuable information for parents, grandparents, and staff to have, especially when Mayor Ganim and our City Council Members are all up for re-election this year. And here is where the problem began. Mayor Ganim and the majority of the City Council were angry that their factual record on funding our schools was being shared at our Community Conversations where hundreds were attending, listening, and learning. How dare we educate our community on their record, but especially in an election year! On February 4, Chair John Weldon called a special meeting with only 26 hours’ notice to. His purpose was to take a vote to cancel the remaining Community Conversations that were drawing hundreds of attendees. The pretense for this decision to cancel our incredibly successful forums was that Mayor Ganim, the City Council and Superintendent Johnson were being “bashed” at these forums. If stating an elected officials voting record is considered “bashing,” then they probably shouldn’t be elected officials. Board Member Pereira was the only person in the meeting who had attended all four community conversations, therefore she asked Superintendent Johnson to give an example of the “bashing” that had occurred. Superintendent Johnson was doing everything in her power to avoid answering the question when Chair Weldon, Vice-chair Jessica Martinez, Hernan Illingworth, Chris Taylor and Sybil Allen quickly moved to call the vote in which they all voted to cancel all further Community Conversations. Please do not be fooled. These five school board members, with Superintendent Johnson’s support, didn’t cancel the Community Conversations because it was what was best for parents, staff and the community; they canceled them because they are good “soldiers” and did the bidding of Mayor Ganim and a large faction of the City Council. You should know that after they were canceled; four of the five city council members who actually attended a Community Conversation wrote to the Board and Superintendent Johnson urging they be reinstated. They found them to be important, valuable, and enjoyed meeting with their constituents. There was a grassroots movement of outrage on social media, Make the Road CT organized a rally denouncing the cancellation of the Community Conversations, Generation Now organized an email drive encouraging their members to email the five members who canceled the forums, Channel 12 News covered it, and more. Although every public speaker at our February 11th regular meeting denounced the cancellation of the forums and urged the Board to reinstate them, Chair Weldon, Vice-chair Jessica Martinez, Senator Dennis Bradley and Chris Taylor voted no on so much as even discussing the matter. Let’s say the 5 BBOE members are right about the reason cited for the cancellation of the forums was the bashing of some public officials rather than intended informational hearings regarding school board finances. Question, so what, I’m sure that those 5 BBOE members have the facts to disprove what ever concerns the other 3 BBOE would have thereby making those 3 BBOE look bad in a open and public forum and democratic way for the voters and taxpayers of Bridgeport and the 20,000 school children. Little Joe Ganim and the dark lord of Madison Avenue don’t want the public to know the depths of their avarice. Current picture….more than a generation later….court cases in rear view mirror, State support of education formulas unreliable to the underserved, and local Boards driven to levels of unproductive infighting from frustration and Bridgeport “strong Mayor” second time around with no education priority in several Annual budget talks? Is Bridgeport so far from Hartford that the youth of Bridgeport get no respect? Compare the local department budget increases to the lack of local education funding, what do you see? Continue to seek Open, Accountable, Transparent and Honest governance including these open meetings for parents and others to understand the ill respect of the elected for the education of youth. Time will tell. JML, Blacks and Hispanics don’t want to rock the boat because they think that some white savior will come along and visit our churches and pop up and give a speech about how concern they are about out issues and if we put them into office that they will address our concerns. It was Thurgood Marshall who founded the NAACP Legal Defense and Education Fund a separate organization from the NAACP, who fought in court and won the Brown v. Board of Education Supreme Court decision that changed racial segregation in public school but we didn’t follow up and unfortunately we listen to white policticans who said will take care of that for you but you have to keep them in office. How is all that waiting for a white savior working out across the community? When a politician shows up at your church does he get asked what faith community he is affiliated with, participates and worships in? What are the faith community leaders doing in terms of active ongoing and organized events to provide information to the ignorant and comfortable about RACISM today? What does it mean to be anti-racist? If you were asked whether you were a racist or anti-racist and appear confused, perhaps a couple hours spent with writing by Prof Ibram Kendi is in order? Need to get our minds in tune about race, racism and anti-racism to escape the terrible waste in our economy, culture and world society. (Ready for a cup of coffee together? )Time will tell. JML, I was giving a small example of how things started after Thurgood Marshall victory in the Supreme Court and how it has continue nationwide. White liberal Democrats in the north seeking votes recognize the voting potential of the black voter especially after the 1965 Voting Rights Act. Remember, at this time the entire south were Democrats until the Brown decision and the Voting Rights Act and those white Democrats didn’t like either of those decision but more importantly blacks voting so the south almost over night became Republicans. Your history is solid as usual. But if a human being was confined as less than a person in the South in the 1840’s and found themselves in a migration in the next century north to cities where confinement to neighborhoods, schools and opportunity was present though perhaps more hidden to the majority; and moving another lifetime beyond civil rights battles to today where The New Jim Crow system confines behind bars more people of color, and urban schools and housing are not set up to provide equal opportunity for all, etc., etc. Who is re-learning their American history? And what will the histories of today say about anti-racist activity of today? Are people that unknowing, careless and content? Who will help instruct and companion them to a different understanding? Remember how Frederick Douglass reverenced learning? Time will tell. We are now into the eighth day since Dennis Bradley’s resignation. We have 22 days left to vote on a replacement. Not only has John Weldon failed to call a special meeting, he unilaterally decided to cancel our regular meeting scheduled for Monday stating “staff” had informed him there was no agenda items that were urgent. Really, our three year $60,000,000 bus contract needs to be voted on. Our CFO sent us an email that further delay could cause significant increases in the cost of our new special ed. buses.Since when does “staff” determine whether the BOE holds a meeting or not?He them immediately followed with a statement that he may want to schedule a special meeting for Monday to discuss the vacancy. This is only our fourth regular meeting this year and the second one we are not holding. That is a 50% cancellation rate. The matter regarding the vacancy should have just been placed on the regular meeting agenda. This is exactly what they did during the boycott. Dennis repeatedly canceled regular meetings and attempted to govern through special meetings. John Weldon is a RINO who takes order from Mario Tesra, Joe Ganim and Danny Roach. I have already raised $4,900, between the GoFund Me page and traditional cash/check donations, to file a lawsuit against John Weldon and his minions. John Weldon and his minions have consistently demonstrated they do NOT care about our over 20,000 students, 30,000 parents and 2,700 employees. Where are council members like Bob Walsh when you need them? It is March. You have 6 months until a September Primary. Surely you can come up with at least one protest a month to continue the momentum. The council members are counting on this outrage to fizzle and die and by June and July with schools closed and summer vacation the parents will forget about this and nothing will be done. But if you have a crowd, and it doesn’t need to be 500 people, at every council meeting they will quickly change their tune. It up to the people and not the politicians to keep up the heat. Let’s get going. The only ones who can silence the people are the people. Why did former mayor Bill Finch and current mayor Joe Ganim want to keep public information about the Board Of Education from the voters? We all know why the City Council has said or did anything because they are scare. Follow the money and those contracts for education.